Errors that led to fingerprint and DNA records of hundreds of terror suspects being deleted were more widespread than thought, it has emerged. The biometrics commissioner said two months ago that 450 profiles had been wrongly deleted from a police database in England and Wales. But in an updated report, Alastair MacGregor revealed the figure was 810. The Home Office, which released the report, said steps were being taken to fix the issue. The National Police Chiefs' Council (NPCC) said the identity of the individuals was known, and "the risks they potentially pose are being managed". Under a new system introduced in 2013, DNA and fingerprint profiles of people who are not convicted of a crime have to be removed from a counter-terrorism database. However, the records can be kept in the interests of national security - such as in cases where someone has been suspected of having links to terrorism - when a senior officer makes a national security determination (NSD). But Mr MacGregor said the 810 profiles had been deleted because police officers had failed to make NSD applications in time. He found that in at least 108 cases there would have been national security grounds to store the data and the records "could and should have been retained". He added: "It is obviously very important that steps quickly be taken to establish whether - and, if so, how - replacement material should be obtained from those individuals and/or other action should be taken to minimise any risk which they pose to national security." Mr MacGregor also revised upwards the number of people on British counter-terrorism databases who have not been convicted of a "recordable" offence, from 3,800 to 4,500. However, he said he was "broadly satisfied" that the issues he raised were being addressed. A Home Office spokesman said: "The commissioner has concluded that steps are being taken to address these issues, and the police have provided further assurances that they will be kept under close review. "The government's full response to the commissioner's annual report will be published in due course." Assistant Chief Constable Alan Barr of the NPCC said the error was the result of "a number of different factors across our processes". "We have worked with the biometrics commissioner to develop a comprehensive plan to rectify the immediate issues and to ensure this will not happen again," he said. "The identity of these individuals is known and the risks they potentially pose are being managed in conjunction with partner agencies to minimise any long term risk to the public." What is a DNA database? 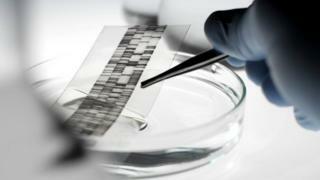 Can we still rely on DNA sampling to crack crime?